Winners of the 2017 Green Brick Awards. 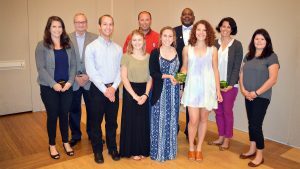 Three members of the NC State community, a student organization and an innovative waste-reducing project were honored with Green Brick Awards from the NC State Sustainability Council on April 20 for outstanding contributions to sustainability. Sponsored by Coca-Cola, the Green Brick Awards have recognized sustainability achievements at NC State since 2004. Each spring nominations are received from the campus community and a selection committee determines a winner in the following categories: Student, Faculty Member, Staff Member, Innovation/Impact and Campus Department or Student Organization.